A fairly mundane blurry photo post on Apple CEO Tim Cook's Twitter account has turned into a minor controversy - you know, of the useless Twitter kind - after people started joking about it and inferring about the iPhone camera quality, based on the shot. 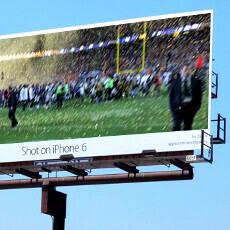 Of course, nobody was even sure that the pic, shot quickly in the excitement around watching the Super Bowl 50 live, has anything to do with an iPhone, but Twitter being Twitter, folks quickly started getting nasty about it, posting collages and witty remarks. Fed up with the drama, Tim Cook's PR department, which is likely in charge of the Twitter account, took the shot down, and replaced it with something more in focus. Not only that, but whoever is managing the Apple CEO's account also blocked the worst offenders, so the saga now has every marking of a typical Twitter storm-in-a-teacup. That's what 140 character limitation does to people, Twitter, remove it before you stock reaches half of its IPO levels. Apple needs to lighten up and have a little sense of humor. It could've been divert to something funny and witty if they thought about it long and well enough. Y'all need to wear 3D glasses to see the glorious moment at its depth of field!!! Tim Cook is a nice person. But the narcissistic "i" cult needed a humiliation to get them to ground. And this is the moment. Celebrate. Apple has nothing to lose here except narcissistic pride. From bad to worse. Now there more things to talk about. First, its the out of focus iPhone shot now its Apple PR defensive behavior. I thought iPhone 6s plus has hardware OIS, and for the price they are charging iPhone 6/6s should get it too. Tim, you're blocking it wrong! I think the second one one is much better. Still, I wonder why he even posted a blurry photo like that in the 1st place? The screen res. and screen size of 6s is too small to see blur properly, especially to an old man with spectacles. iPhone people don't know tech, not even the ceo. He had no clue what he was doing. Oh, thats rich, like you people don't clean up the messes you make? Not like cry-babies crying about it and denigrating everyone who notices. But maybe you do? LOL... so childish, i simply wish Apple learn from all criticism & include OIS on next iPhone 7 plus 32gb as a new standard. Almost every single twitter user that has ever lived has deleted a tweet which attracted the negative attention. Most humans on earth, won't let a mistake stick around. This is not childish. This is cleaning up a mess. Damage control if you will. Or aren't you familiar with the concept? You wouldnt say this if it was Samsung CEO. Of course I would. Logic does not discriminate.